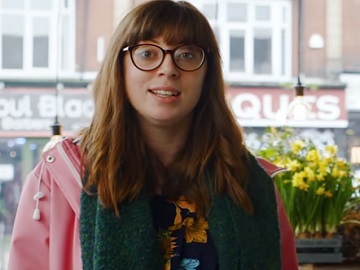 Nationwide Building Society continues its “Voices Nationwide” campaign with a new installment featuring a poem written and performed by Hannah Swingler, about the commitment over the years with her childhood sweetheart. Entitled “High Street Romance” – after the poem’s titled, the 60-second spot is rooted in the idea that, for Nationwide, branches have an important role to play in the community and is actually a way of reaffirming its commitment to the high street that every town and city that has a Nationwide branch today, will still have one in two years. But still we tried to stall. I said “Yeah… yeah, that’s cool”. By the bakers, or thereabouts. At the end of the advert, onscreen lines read “We keep our promises too. We promise that every town and city with a Nationwide branch today, will still have one for at least the next two years.” The company’s tagline, “15 million members building society, nationwide,” is also seen flashing across the screen. In another recent campaign, “Together Against Hate,” Nationwide Building Society has shined a light on the abuse posted online against real people featured in advertisements. The British mutual financial institution has partnered with Channel 4 and brands Maltesers and McCain to show examples of real abuse posted online and highlight that we all should stand up for diversity and inclusion and not tolerate online abuse. In one of the spots included in the campaign, writer and performer from South London SugarJ Poet recites a poem titled “Face to Face,” about the importance of face to face interaction in a world where social media impacts everyone’s lives.